This hotel is 100pct non smoking. Welcome to Homewood Suites by Hilton Galveston a charming and convenient hotel with all the comforts of home. Ideally set on the east end of popular Seawall Boulevard our all-suite hotel is moments from Gulf Coast beaches and restaurants and minutes to Schlitterbahn Waterpark Moody Gardens and Seawolf Park. Ask our friendly staff about our complimentary shuttle service to area attractions. Every modern suite at our extended-stay hotel has a living area work desk dining space and full kitchen. Stay connected with complimentary internet access and relax on the sofa watching the 43-inch TV. Traveling with family. Our larger suites feature private bedrooms and we have cribs and high chairs to ensure young ones are comfortable. Connecting suites and accessible suites are also available. Wake up each morning to a complimentary hot full breakfast and join us on weeknights for a complimentary evening social*. Our Suite Shop is open 24 hours for drinks snacks and frozen meals and a dozen Galveston restaurants are within a mile of the hotel. Step outside to our beautiful pool and cabana area perfect for lounging on sunny afternoons. 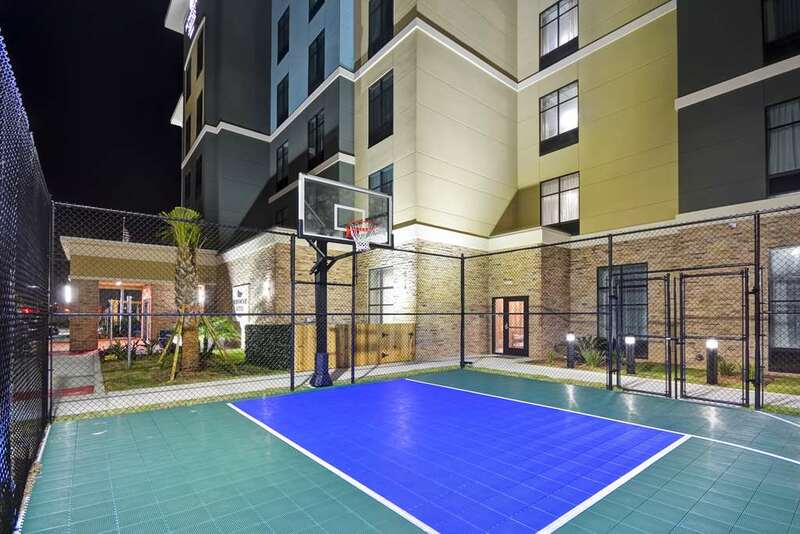 Play basketball or volleyball on the sport court or burn calories in our fully equipped fitness center. For your convenience our Galveston hotel has stylish meeting space for up to 60 people plus a 24-hour business center. *Local and state laws apply.